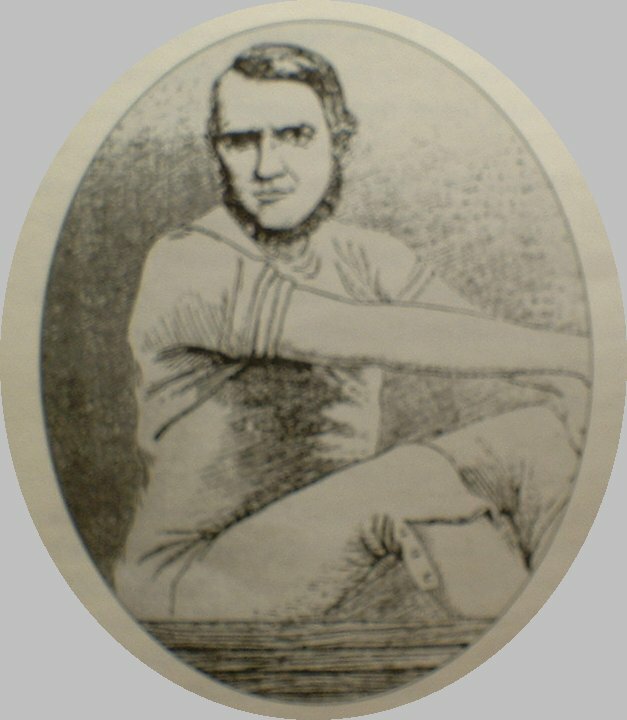 Harry Clasper was born in Dunston, nr Newcastle-upon-Tyne in 1812, and was the first of the great oarsmen that the Tyne produced in the heady days of professional rowing. Born in Dunston, nr Newcastle upon Tyne. H. & R. Clasper raced Robert bow 9 stone & Thomas stroke 8st10lbs Coombes cox Henry Cownden 4st 5lbs for £200 in the coxed pairs racing from Putney to Barker's Rail, Mortlake. (20/07/1848)Thames Regatta: 3 Claspers won fours for £100. Harry Clasper stroked the winning four. (July) Thames Regatta: Harry Clasper stroked the winning four, a composite Thames and Tyne crew including Robert Coombes "it is said that circumstances, not inclination exactly, conduced to this union" (Newcastle Journal 14.6.1849). Raced for £100. (August) Talkin Tarn Regatta: Clasper and Hawks crew won fours for £20, J. & W. Taylor beat H. & R. Clasper in pairs, H.Clasper won singles. Thames National Regatta: Pocock & H.Clasper won pairs, H&T Clasper, Wood, Maddison beaten in fours for £100, same crew won fours prize for £40, North v South VIIIs race over London Regatta course for £27 won by Winship, Davidson, Bruce, Maddison, Cook, H&T Clasper, Wood beat Cole, R&T Coombes, Mackinney, T.Mackinney, Newell, Goodrun, Kelly. (August) Thames Regatta: Harry Clasper stroked the winning four, a Thames/Tyne composite. Manchester: Clasper broke an oar and lost to Ault, Wood, Winship, Bruce. (28/08/1857) Manchester Regatta: H.Clasper, Chambers, Ault, Winship won fours. (August) Nottingham Bank Holiday Regatta: Sculling prize of one of Clasper's boats worth £30 and a fours' prize worth £30 which attracted entries from Newcastle (Claspers), Gateshead (Taylor) but Harry Ault's crew of the Shakespere club in Manchester beat the Trent crew in the final. Ault's crew offered a further challenge to the Trent crew to race for £50 in Nottingham or stake £50 against £30 to race in Manchester (Bell's Life 3.7.1859) [Check dates this doesn't tally and Bell's Life shows similar prizes for Nottigham Regatta in 1853]. (06/10/1855) H.Clasper beat R.Campbell on Loch Lomond for Championship of Scotland and £200. (09/11/1858) Thomas White beat H.Clasper on Thames for £200. (27/06/1858) Durham Regatta: H. & J. Clasper won pairs beating Chambers & Winship. H. & J. Clasper, Chambers, Winship won fours. (23/08/1858) Manchester Regatta: H. & J. Clasper, Chambers, Winship won fours. (09/07/1861) J.H.Clasper beat Pocock on the Thames.